Somebody has to tell Sen. Tom Coburn that he was elected to office and is bound by their rules. 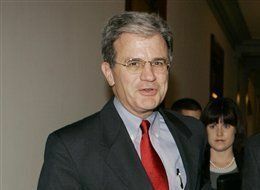 (UPI) -- Sen. Tom Coburn, R-Okla., said Thursday he would invoke privilege if asked about advice he gave to Sen. John Ensign, R-Nev., on handling an extramarital affair. Coburn said he was talking to Ensign about his tryst with a former staffer in his capacities as a doctor and a man of the cloth, Roll Call reported. "I was counseling him as a physician and as an ordained deacon," Coburn said. "That is privileged communication that I will never reveal to anybody. Not to the (Senate) Ethics Committee, not to a court of law, not to anybody." Doug Hampton, whose wife had engaged in an affair with Ensign, has claimed Coburn urged Ensign to pay the Hamptons millions of dollars after Hampton confronted Ensign about the affair. "I categorically deny everything he said," Coburn said. Coburn said he has acted as a counselor to other lawmakers in the past. "Ya'll don't know about all the people I've counseled," he told Roll Call when asked why Ensign sought his help. Coburn is bound by congressional law, I would imagine, and if he's going to stick his nose into salacious dealings that may cross the line, then he'll need to answer whatever questions come his way.